Oil companies say they want to help stop climate change. But we shouldn’t believe them because of what they’ve done in the past, writes Greg Muttitt. European oil companies said in June 2015 that they all want a global climate agreement. ‘We want to be part of the solution,’ wrote BP, Shell, Total, Statoil, BG and Eni, in a letter to UN climate chief Christiana Figueres. They think the solution is controlling the price of carbon, and using gas instead of coal. They don’t really want a solution. They are playing the same game they have played for the past 20 years. But these European oil companies are better than the US oil companies. ExxonMobil is one of the worst. In 1990, Brian Flannery from Exxon tried to change the Intergovernmental Panel on Climate Change (IPCC)’s first report, to make it weaker. He went to many climate agreement meetings and IPCC meetings until he retired in 2011. In 1989, Exxon, with Shell, Chevron, Texaco and other companies, started the Global Climate Coalition (GCC), to fight against action on climate change. In the 1990s, the GCC tried hard to make the public not believe in climate science. In 1992, they said that if we keep levels of CO2 the same, this will not have much effect on the environment. They go to all the international climate agreements, and try to get countries to disagree. The GCC said the 1997 Kyoto Protocol (climate agreement) was only to take money from the US. After this, they fought more against climate agreements inside the US. The GCC helped George W Bush decide to leave the Kyoto Protocol in 2001. The GCC ended in 2002, when some of the members left because of public pressure. But US oil companies still gave a lot of money to persuade people climate change is not happening. The American Petroleum Institute wrote once that they will win when the public understands that some things are not sure in climate science. Between 1998 and 2010, ExxonMobil gave at least $23 million to groups who say climate change is not happening. In 2008, they stopped giving money to nine of these groups, but it continued to give money to 28 others. It is still part of the American Legislative Exchange Council (ALEC) - one of the strongest groups fighting against climate laws in the US. The European oil companies work in a different way. BP and Shell first tried to show they are leading the fight against climate change in 1997. They said climate change is really happening and left the GCC. Their solution then was the same as now: make people pay for carbon, and produce more gas. At the same time, both Shell and BP had problems with their reputation (Shell because of the death of Ken Saro-Wiwa in Nigeria and the problems with Brent Spar; and BP because of links with Colombian death squads). So these two companies started the new idea of ‘corporate social responsibility’. Climate change was an important part of this. 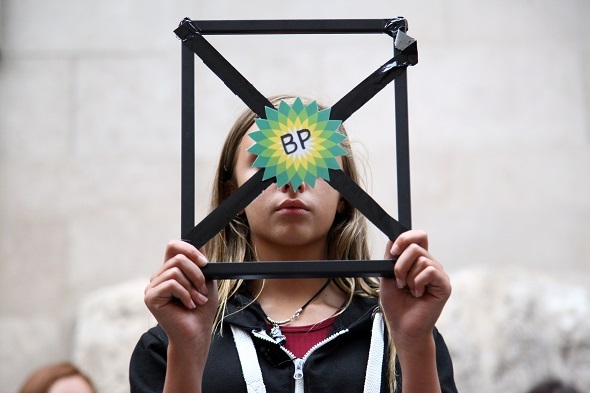 One group of advisors told BP to think of NGOs as sea animals. ‘Sea lion’ NGOs were always friendly to companies, so they could work with them, but they didn’t have much power. ‘Sharks’ were always aggressive, and there was not much point trying to work with them. So BP should try to work with the ‘dolphins’, who were only friendly to the companies with modern thinking. Also, these ‘dolphins’ were trying to make the sometimes aggressive ‘orcas’ that BP was not the worst company. So many NGOs started working with BP and helped to make BP a new reputation as a climate leader. Shell and BP invested money in renewable energy (but less than a hundredth of what they invested in oil and gas). BP invested most money in wind and solar in 2006 - $300 million; but its adverts for ‘Beyond Petroleum’ in 2000 cost $200 million. Both companies closed their renewable energy departments in 2009. But BP and Shell were really doing the same as the US companies: to stop climate change action having an effect on business. It’s their ‘3-D’ plan: deny, delay, dominate. One good example is the carbon pricing. ETS – Emission’s Trading Scheme – is the most developed carbon pricing mechanism in the world, but it is a big failure. It has given out so many permits to allow companies to pollute. So it’s encouraging people to use more carbon! What went wrong? BP planned a British carbon pricing scheme. Then they worked hard to make sure the European plan was the same. Then, BP and others fought to get too many permits. But if the companies want carbon pricing, to help companies work to a future with less carbon, it is not good that they also want the government to continue giving a lot of money to subsidize coal, oil and gas. In March 2015, the UK government gave $2 billion to oil companies (over five years), and cut tax for oil production. Paul Goodfellow from Shell said this was a very important change. When Alaska said it would give $5.2 billion of tax cuts (over six years) in 2013, BP said this was not enough help. People say we need gas until renewables can produce enough energy. So they need to give tax cuts to gas or coal and oil, not all of them. If they give more money to help gas, they have to cut coal and oil quickly. The IPCC says that, if we want a good chance of stopping world temperatures going up more than 2°C, the total CO2 emissions since the Industrial Revolution cannot be more than 2,900 gigatonnes. By 1997, we still had half of this ‘carbon budget’ left. Now we have less than a third. If we continue with these emissions, we will reach the limit in 2037. In 1997, we knew the world had more fossil fuels than this limit. Now, if we use gas (until we have enough renewable power), we would need to stop using coal immediately, and leave nearly half the oil in the ground. The six companies that said they agreed with climate action in June have been getting more gas out of the ground since 1997 – 76 per cent more. But they have also been getting more oil out too. And, in 2011, Shell fought for more gas in Europe. ‘Gas is good for Europe, and Europe is good at gas,’ said Malcolm Brinded, from Shell. The UK government and many energy companies fought for this, for Shell. And they succeeded in ending the European targets for renewable energy and energy efficiency after 2020. In 1997, Shell agreed that there is a problem: our fossil fuel reserves are bigger than the carbon budget. Heinz Rothermund, a Shell UK Managing Director, said: ‘is it good to look for and develop new reserves if the reserves we have already discovered will produce too much CO2?’ But, together with other oil companies, it is still looking for a lot more oil. Shell spent about $1 billion in 1997, then $3 billion in 2007 and nearly $7 billion in 2014. So there are a lot more oil and gas reserves now, and a lot less of the carbon budget left. BP, Shell and Exxon all now say that they expect the world temperatures will rise more than 2°C. And they plan their investments on this. They say we need more fossil fuels to get energy to the poorest people in the world. Shell CEO Ben van Beurden says we need to balance the moral responsibility with the need to fight climate change. But climate change affects the poorest people in the world more. And it would be more effective to give these poor people renewable energy. The big companies want people to think that oil and gas must continue to grow. So there is no point creating and alternative future. When the six European oil companies wrote to the UN in June, they said they wanted to be more involved in making agreements about climate. ‘Our companies want to talk to the UN and governments,’ they wrote, ‘to find a solution.’ But they want to find a solution that doesn’t cut their profits. In September, Shell started the Energy Transitions Commission to give ‘independent’ advice to governments on how to do something about climate change and also continue economic development. Oil companies cannot help make climate agreements. They don’t believe we need to keep the world below the 2°C limit. And they do not want action to cut the use of fossil fuels. So they make the problems worse. Oil companies have always tried to stop progress with climate talks, from the outside or the inside. When the world decided on new smoking laws, they did not do this with the tobacco companies. Corporate Accountability International wants the same to happen with climate change. We must not invite oil companies – we should keep them far away. NOW READ THE ORIGINAL: http://newint.org/features/2015/11/01/still-biting/ (This article has been simplified so the words, text structure and quotes may have been changed). This page was last edited on 19 November 2015, at 20:36.